Since the last post, Xmas and New Year have come and gone, and here we are kicking off a brand new year of modelling. Over the last few weeks, work on the layout has been sporadic to say the least. Just before Xmas, I had started to work out the riser heights of the grade from the bridge through Kankool, but realised before I could go any further, I needed to mark out the 42” reference height around the layout, as this is basically the layouts’ datum point for roadbed height. 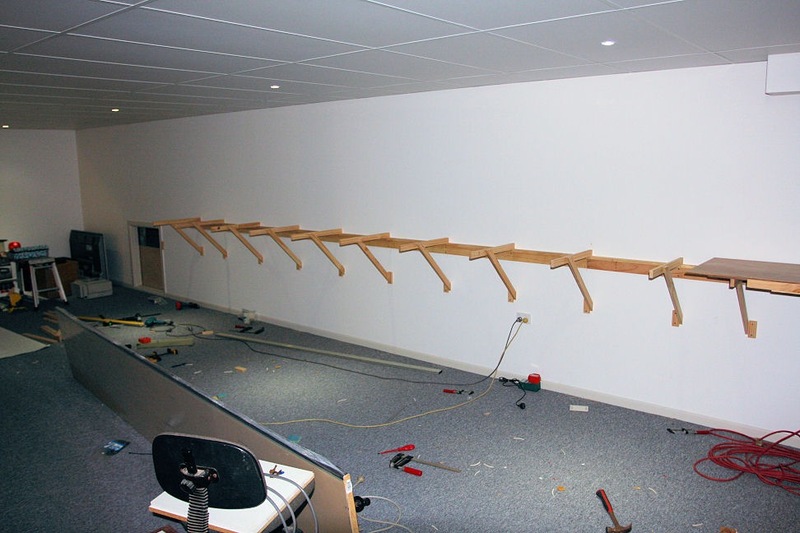 Early on before any benchwork went up, I had marked out a 42” height along the walls to Kankool just using a spirit level and straight edges, but was always wary of its accuracy. I mean, I only had to have the bubble in the level a millimetre out at one mark, and by the end of the run, I could be out maybe 10mm. So I came up with the idea of using a water level. So, it was off to Bunnings to get some clear PVC hose. 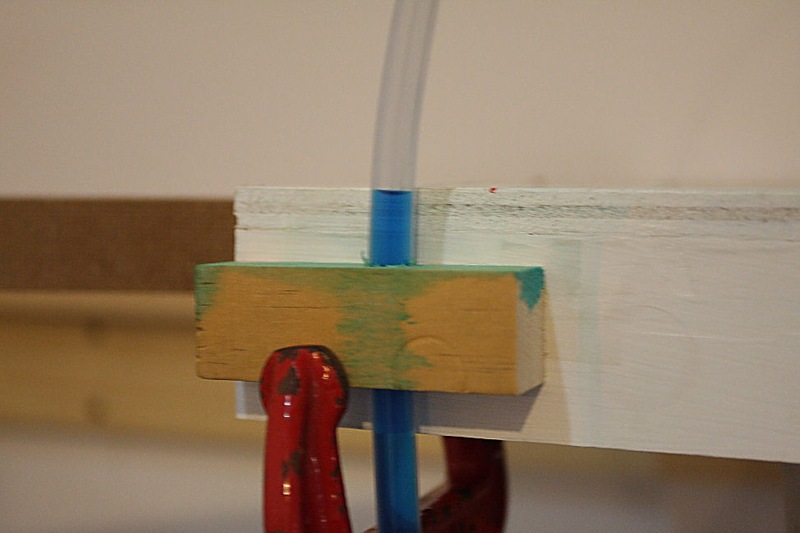 After filling it with water, and some coloured food dye to make the water line a bit easier to see, one end was setup at the end of the storage yard benchtop. I fashioned a simple clamp to hold the tube in position. I soon realised that this would be a two person job, so since my father was down for Xmas, I commandeered him. Whilst he held the tube at the storage yard end, I moved the other end to various points around the walls and benchwork, and when the water found its level at each point, a mark was made with a red pen. We soon got into a rhythm and eventually made marks all the way from the bridge to the teardrop peninsula. 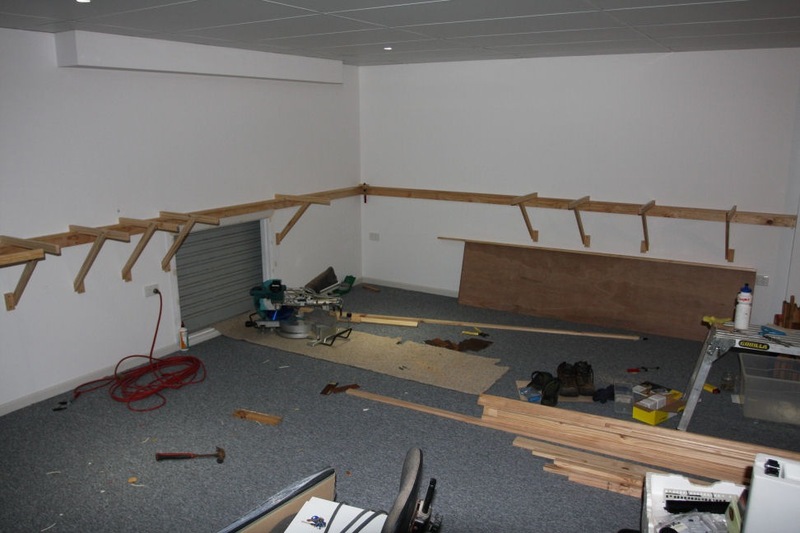 The next job was to remove the temporary joists that were placed to support the spline whilst under construction and fix the permanent ones in position. I only had to do this on the section under Kankool and along the first peninsular wall. These were made from 2×1 DAR and placed around 500mm apart along the L girders. 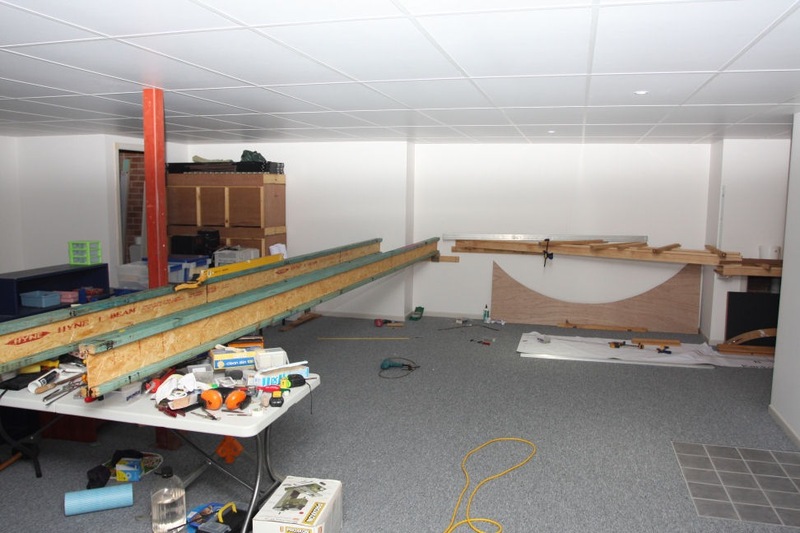 I wasn’t too worried about the length at this point, as I can always extend the joist when I come to attach the fascia. The view above also shows some benchwork changes I made the other week. 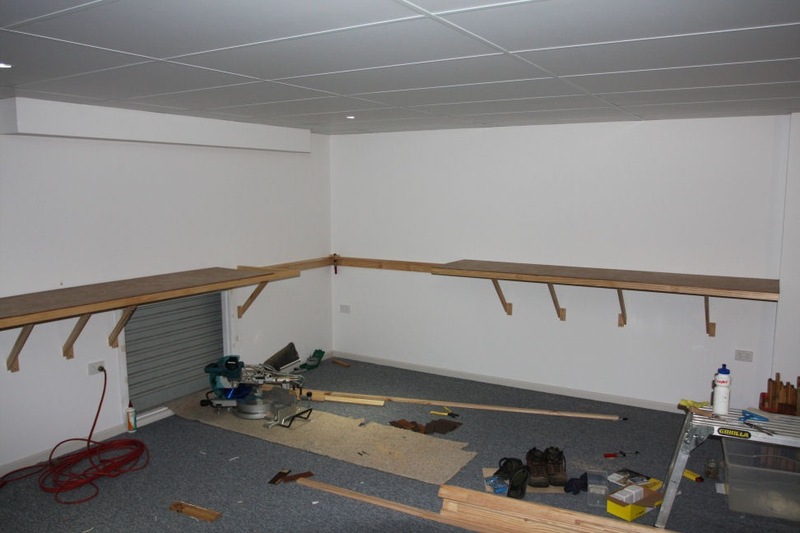 The original design was to have the benchwork supported on shelf brackets – see previous post. The main reason for this was to eliminate the need for legs which I always thought would get in the way. But, ever since I constructed that section, there was a lot of movement in the benchwork and it wasn’t really solid enough. 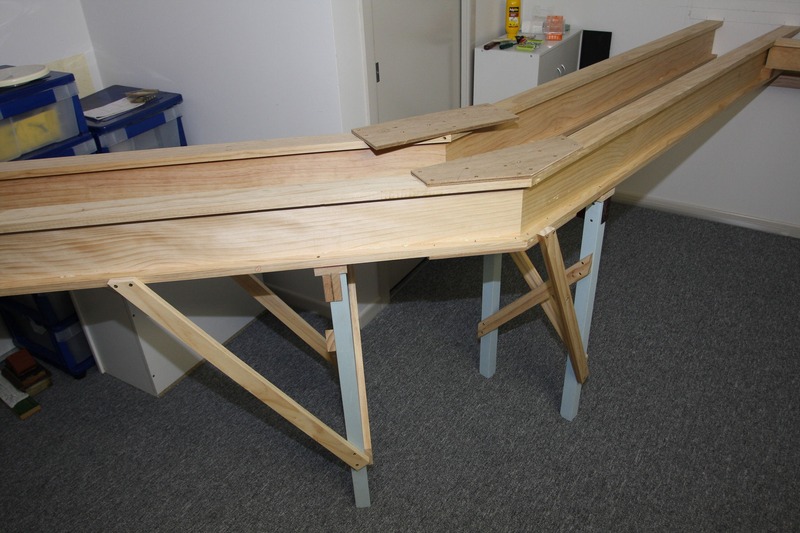 So I needed to do something prior to setting the roadbed height and attaching risers to the joists. Andrew was around one day, and after both of us pondering the problem, he suggested the idea of moving the inside L girder back towards the wall and fixing it to the wall. 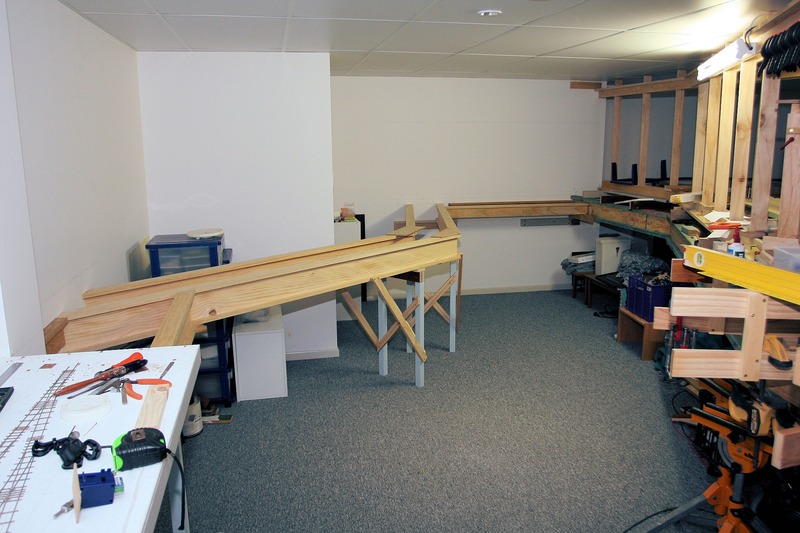 The outer girder would then be supported by 2×2 pine legs. 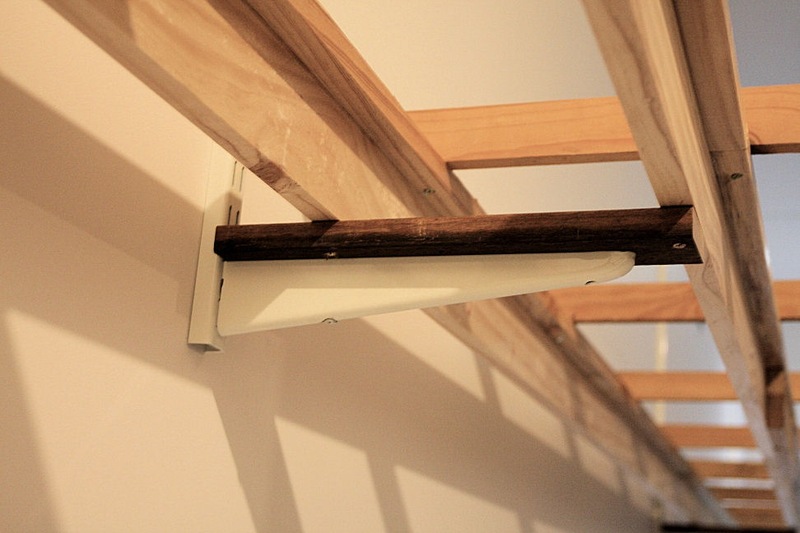 This would then allow the shelf brackets and tracks to be completely removed. 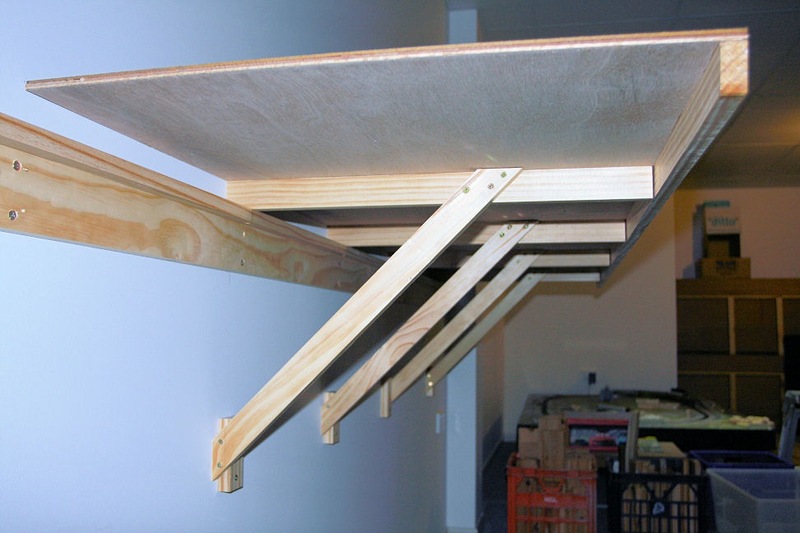 I still may use this method for the upper deck, but am thinking of placing the brackets at every wall stud, ie 600mm apart. The resulting benchwork is now much more solid and I am much happier with it. The legs will still end up being far enough in behind the fascia to not be a problem. 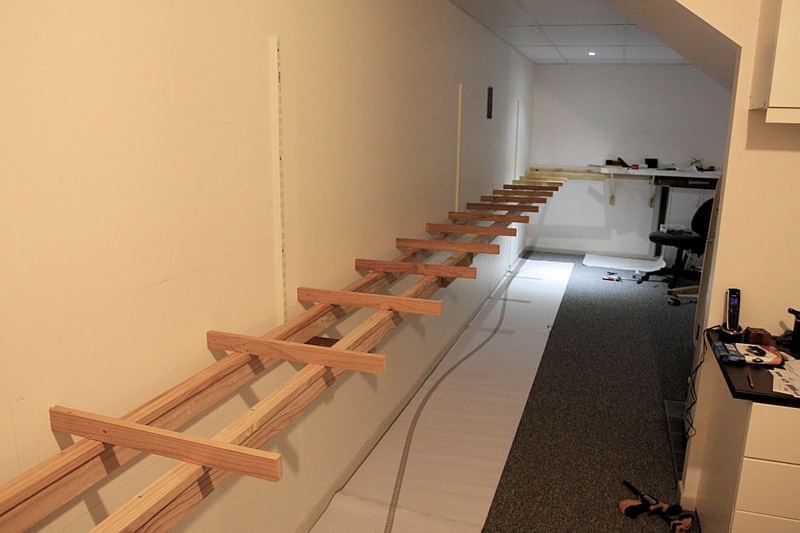 In my next post, I will explain how I have set the grade and risers to the correct height. 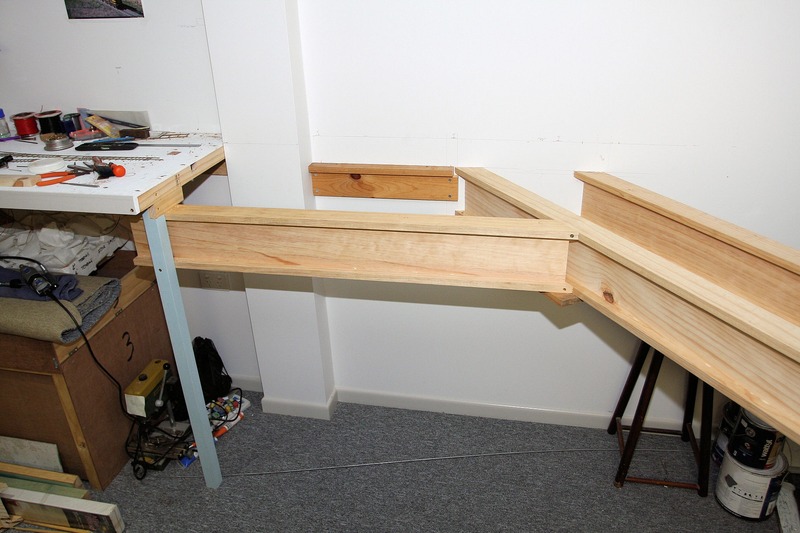 Well, after about 20 years since I first started modelling in HO, and about 2 years of planning the layout in the current train room, I have finally started on the benchwork. I will be kicking off with the storage yards and laying all the track and points and getting the point motors installed. 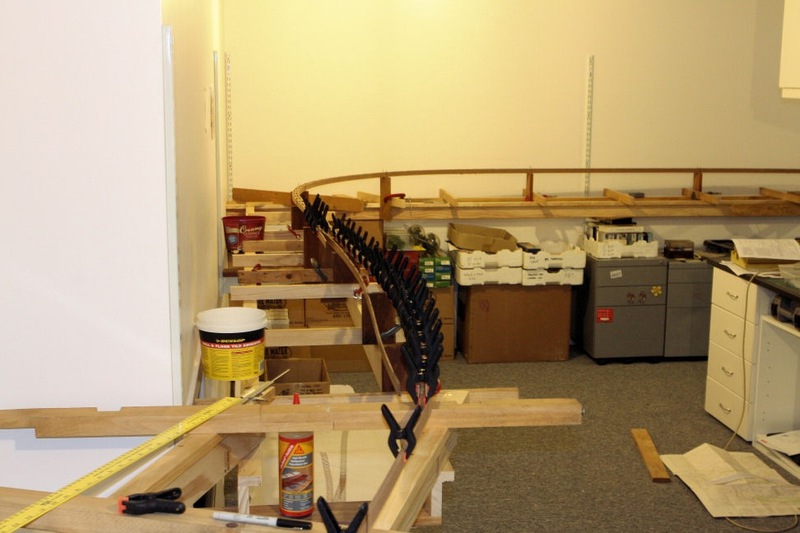 Then will come the benchwork and spline roadbed towards Kankool. More details on spline roadbed later. 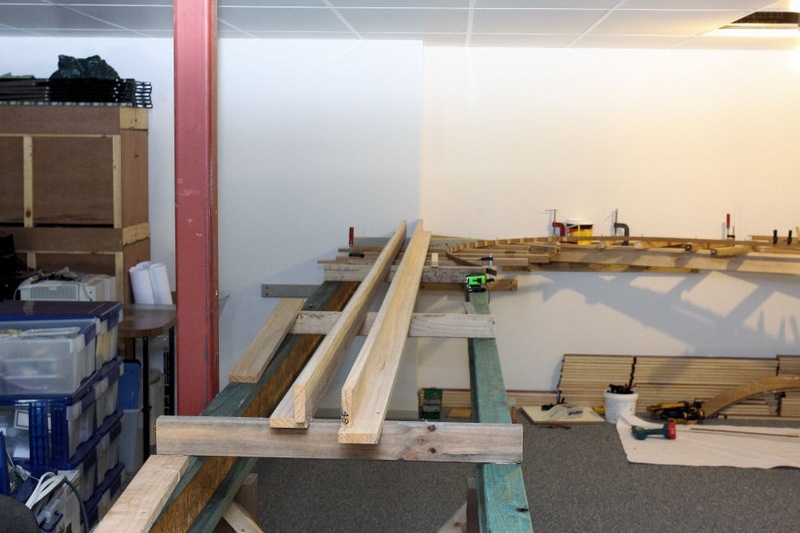 Here are some shots of the first sections of benchwork. Click on the image to view a larger version. Use your browser’s BACK button to return to this page. 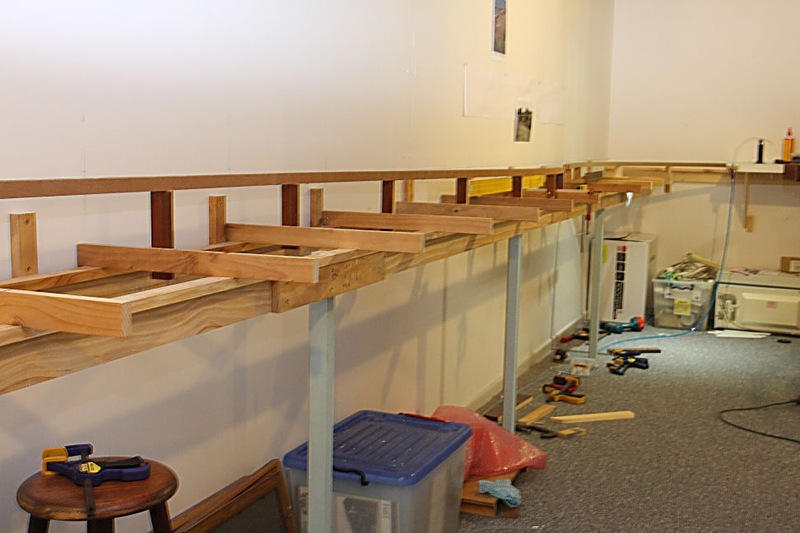 I started off making sections of ‘L’ girder from 2×1 and 3×1 DAR pine which were screwed to the walls, then using sheets of 2440 x 1220 x 9mm 5 ply exterior grade plywood cut in half to give 2440 x 610mm sheets, 2×1 DAR pine was glued and screwed to the front edge of each sheet. This helps to strengthen the front edge and to keep it straight. 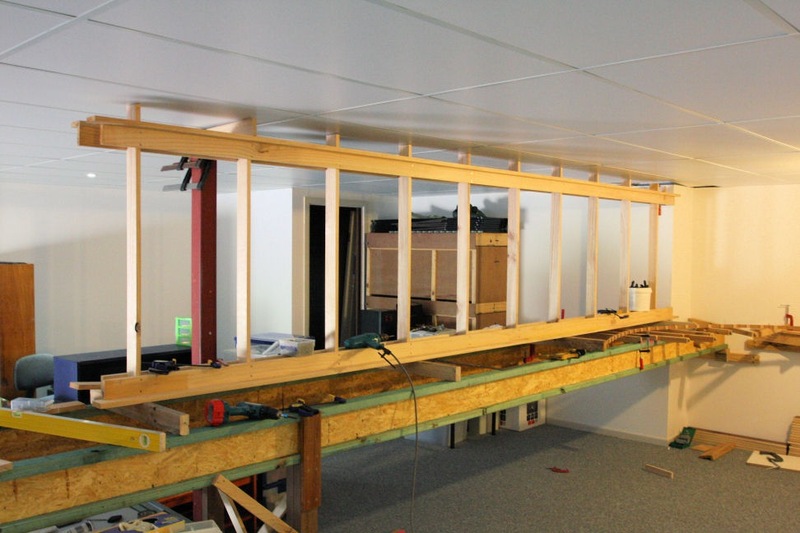 The supports for these sheets were then made from more 2×1 and braced back to the wall. The finished height to the top of the plywood is 42 inches (1067mm). 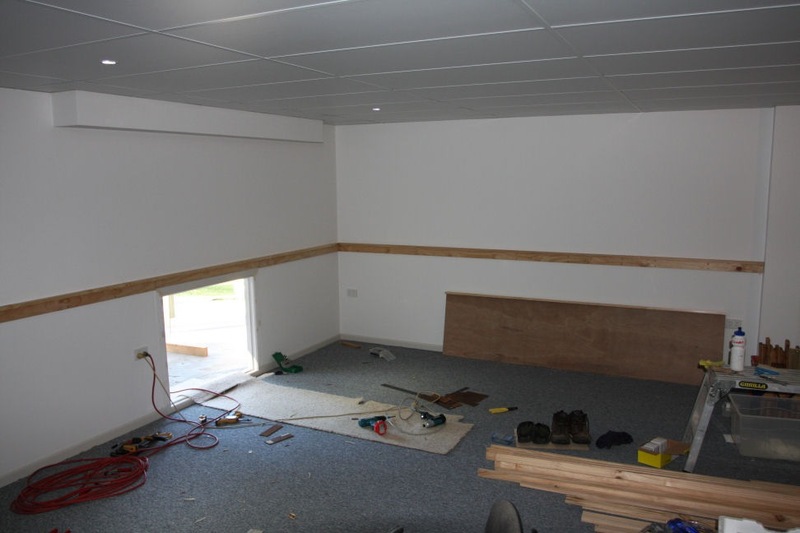 The plywood will then be screwed down to the joists, with joining plates attached under each join to give added strength. 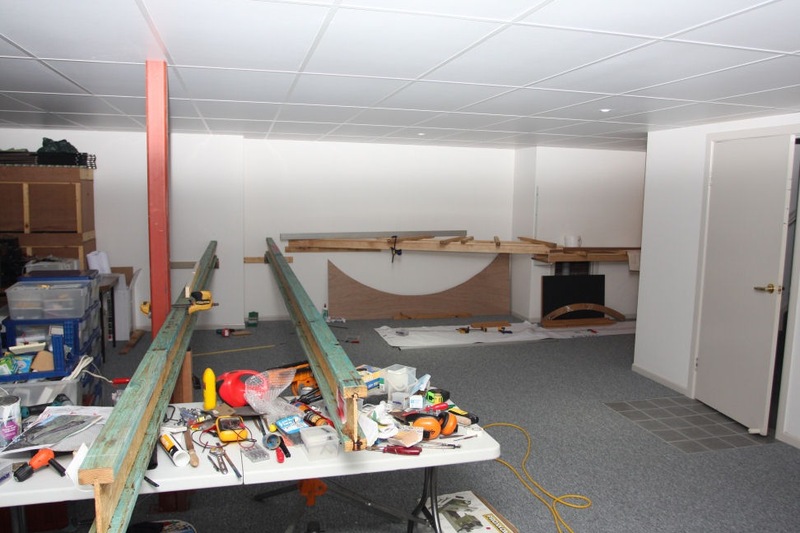 I have still to build the supporting framework in the corner to carry this section of plywood. I hope to complete all this first section of benchwork next week and begin marking out the track centres for the yards and start laying track.